KHS Platoon - model series. The extension LDR stands for Leader and represents the new spearhead of the model series PLATOON. 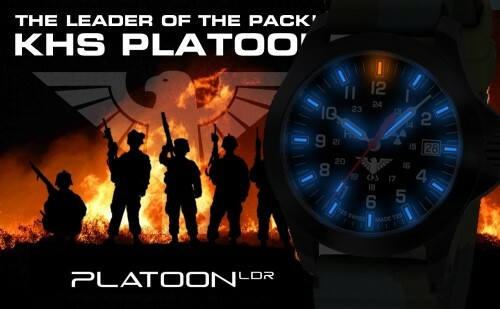 Optimized case design "stealth cut"
The PLATOON LDR is now also available for the first time as GMT with second time zone. The new PLATOON LDR is not only an aesthetically great success, but also a very robust special operations which quickly found their lover in the short time since it gives the platoon LDS commercially. The exquisite detailing and built-in functions to fall. 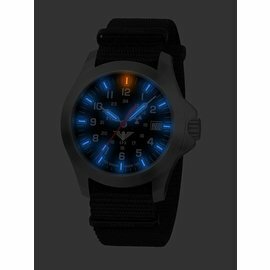 Built in Switzerland (swiss made), this rugged military watch of course again with the permanent lighting system tritium (H3) the company mb microtech from Switzerland and equipped at a price that is more than amazed.